From the Cumberland Gap to the Atlantic Ocean, this is Virginia Water Radio for the week of December 10, 2012. This week, we feature a musical selection commemorating voyages to explore the Chesapeake Bay region in the early 17th Century. Have a listen for about 40 seconds. You’ve been listening to part of “Exploring the Rivers,” by Timothy Seaman on his 2006 CD “Jamestown: On the Edge of a Vast Continent,” from Pine Wind Music. The tune commemorates the voyages by English colonists at Jamestown to explore the lands, waters, and native peoples of the Bay and its tributaries. Led by Captain John Smith, the expeditions between 1607 and 1609 covered some 3000 miles of Bay waters, including rivers we now call the Elizabeth, James, Potomac, Rappahannock, and York. In 2006, Congress designated the routes of those expeditions as the Captain John Smith Chesapeake National Historic Trail, the country’s first national water trail. Historic and natural resources sites on the trail range from First Landing State Park in southeastern Virginia to the Susquehanna River in Pennsylvania. Thanks to Timothy Seaman for permission to use this week’s music. Captain John Smith’s 1612 map of Virginia. 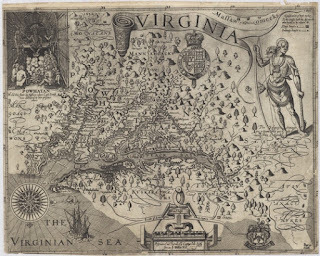 Image provided for public use by the Maryland State Archives, “Charts and Maps Used by the Early Settlers of Maryland,” online at http://msa.maryland.gov/msa/educ/exhibits/html/mpt.html (accessed 12/10/12). Acknowledgments: “Exploring the Rivers” and the 2006 CD “Jamestown: On the Edge of a Vast Continent” are copyright by Timothy Seaman and Pine Wind Music, used with permission. Mr. Seaman’s Web site is http://www.timothyseaman.com/. Sources: Information on the Captain John Smith Chesapeake National Historic Trail was taken from the National Park Service Web site at http://www.smithtrail.net/; the “John Smith Voyages of Exploration” Web site by Penn State University and the Smithsonian Institution at http://johnsmith.psu.edu/home.aspx; and the Chesapeake Bay Gateways Network Web site at http://baygateways.net/smithstudy.cfm. For more information on the trail, contact the National Park Service’s Chesapeake Bay Office at 410 Severn Avenue, Suite 314, Annapolis, MD 21403; phone (410) 260-2470. “Virtual Jamestown” provides an interactive map of the Smith voyages, where users can see the routes, names used by Smith on his maps, current names, etc. ; online at http://www.virtualjamestown.org/smith_voyages/introduction.html. “Virtual Jamestown” is a project of Virginia Tech, the University of Virginia, and the Virginia Foundation for the Humanities and Public Policy.